For nearly 20 years now, we have all sat idly by, watching the Federal Reserve obsess over the stock market like Clarice in Silence of the Lambs obsessed over Hannibal. It is high time the Congress of this United States got together and limited the Fed and or audits them because right now they have us hanging over a cliff like Wild E. Coyote after he chases the Road Runner too far and the inevitable drop is coming. The Fed was not always obsessed with Wall Street. There was once a time in the old days when the Fed paid attention to things that mattered like the price of milk, eggs and meat as well as job production and GDP growth. Somewhere along the way Allan Greenspan, AKA “Mr. Potato Head,” got a hold of the Fed as its Chairman and suddenly he didn’t care about inflation or the economy and the only barometer of Fed policy became the performance of the stock market. When historians look back at us 100 years from now they will think of Greenspan in the same way we think of Caligula Caesar for ordering ships to line up at the Bay of Baiae, a vital shipping port at the time, so he could ride his cherished horse across it. He ignored all of the important economic priorities so he could ride his horse across a Bay? In some ways the Fed has behaved with similar madness for over 20 years. There is now talk of ‘negative’ interest rates coming and current Fed Chair Janet Yellen has already warned banks to be prepared for this possibility. How did this madness occur? We believe it started with the Fed’s obsession with stock market performance and is now the reason why they cannot just exit gracefully. In the late 1990’s the economy and stock market were humming along at a nice pace when Greenspan declared there was irrational exuberance in the stock market and basically raised interest rates not because of inflation or an overheated job market but because he didn’t like the price valuation of Amazon, AOL and other technology ‘dot com” companies. In retrospect he has been proven wrong because Silicon Valley has take over the world and it can now be argued that Apple in 1999 was way under valued as was Yahoo, Microsoft and Intel. The world was changing but Mr. Potato Head was trying to apply valuations that were traditionally used for Sears, IBM and GM. The world was forever changed with the internet, cell phone and computer laptops and some saw it while others like Greenspan viewed it as a passing fad, like the Hula Hoop or Cabbage Patch dolls. Interest rates were unnecessarily raised by him and it set off a 2000 recession and stock market collapse. We believe Greenspan himself was shocked by the market’s reaction and instead of dealing with the decline, a recession was declared and less than 6 months after raising rates he began dropping them dramatically and dropping them BELOW the interest rates when he declared irrational exuberance! This is where the obsession of Wall Street began and continues to this day. When the market and economy recovered, Greenspan and his friends left rates so low for so long that investors not only put money in the stock market, but also began investing in Real Estate. Despite obvious signs the economy could use a normal rate increase after a recovery, the Fed sat on the sideline like a scared kid watching a UFC fight and the real estate market heated up to the point of a lava flow and suddenly 3 bedroom 2 bath homes in an average neighborhood were selling for $300,000 because of all the interest only loans and low rates out there. Buyers who had a combined income of $75,000 were suddenly buying $600,000 homes in gated communities without realizing that at some point the piper will and always does get paid. Despite this really ‘Irrational exuberance” , the Fed was afraid to raise rates and as a result when the house of cards fell, millions and millions of Americans went bankrupt and lost their home. It’s ironic to think that Greenspan (ok I will stop calling him Mr. Potato Head) was worried about investors losing their stock market money which is largely discretionary savings, but stood by idle knowing they would lose their homes in the real estate bubble they created. The rest is history as they say. The Fed left interest rates at near zero for 8 years and opened the fed window for Wall Street Banks and Brokerages to borrow and then proceeded to implement Quantitative Easing I, II, III, IV and now there are calls for them to do another round because the market sold off 3000 points. Our view is, so what? If the market continues to drop, who cares? It will reach a certain point where the laws of supply, demand and valuation (capitalism at its best) will kick in. If Apple drops from $95.00 per share to $40.00 per share in the next 6 months would you stay out or would you come in like a vulture to feed off a carcass for a free meal? This is capitalism and this is when true Brokers and Financial Advisers do their job and tell their nervous clients that everyone around the world is not going to stop buying I-phones. The manipulation of the Fed by the stock market reminds me of the games Hannibal played with Clarice in Silence of the Lambs. Every time she thought she was getting a grip on him and getting the information she needed he switched gears and made sure he controlled the relationship. The Fed is now faced with the realization that the economy is indeed unstable despite a market that is double Mr. Potato head’s irrational exuberance mark from 15 years ago. (Sorry, I had to get that in one last time). As they struggle with bank worries in Europe, the collapse of oil prices and the very real threat that major US banks will have exposure from oil industry defaults on credit lines used by Oil Drillers and manufacturers to pursue gas they hoped they would sell for $100.00 per barrel not $15.00 a barrel, the fed once again is ignoring that and focusing solely on what the big boys on Wall Street want. Once again the Fed is discounting everything to keep the stock markets happy at the expense of everyone. 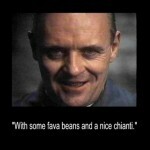 They are running out of options and quite soon the Fed will be sitting down with Hannibal having nice Chianti and some fava beans. ← WHAT IF FINRA REGULATED WASHINGTON?